A new approach puts people at the center of the water discussion. The number of water “wedges,” or strategies to improve water security, that could be used in water-stressed basins. Researchers at McGill University and Utrecht University tested six strategies that could reduce the number of people living in water-stressed basins by 2050. Click image to enlarge. Seeking clarity and comparability, Tom Gleeson wants a new measuring stick for the big thinkers trying to resolve the world’s water supply problems. The groundwater expert at McGill University has two ideas, outlined in a commentary written with frequent collaborators at McGill and Utrecht University and published online in the journal Nature Geoscience. Together, the ideas are a guidepost to a future in which more people have secure water supplies. First, Gleeson offers a new diagnosis of the challenge, a diagnosis with an economic bent. Reducing water use, he argues, should not the paramount goal for the world’s movers and shakers – the regional development banks, the national aid agencies, and the professional class that runs the United Nations – that are his target audience. After all, not all water has the same value. A gallon saved in dry Cairo is arguably more valuable than the same gallon in the moist tropics. Instead, the goal for these global development organizations should be more personal: reducing the number of people who live in “stressed” watersheds, those where more water is taken from rivers and underground sources than is environmentally and socially sustainable. For Gleeson and his colleagues, this is where the emphasis should be placed – on water stress, which relates to the availability of water. The second idea is how to bridge the gap. To assess water-saving and water-creating projects that would reduce the number of people living in areas of water stress, Gleeson proposes a diagnostic tool borrowed from another global conundrum and refurbished for a new audience: the water wedge. For years part of the climate change debate, wedges are a tool for chopping a complex and daunting problem into digestible chunks. They were described in a 2004 paper by two Princeton University scientists. In the climate arena, wedges represent a fan of actions – from cutting vehicle pollution to slowing the rate of tree-cutting – that collectively can achieve the big goal of keeping global temperatures from rising more than 2 degrees Celsius. Water wedges have a history too. The concept was introduced in 2010 by Peter Gleick, a noted water expert and president of the Pacific Institute, a think-tank. But whereas Gleick’s wedges take as a goal a reduction in water use, Gleeson’s slices target his new diagnosis of water stress. Today, about one in three people live in a highly stressed watershed. 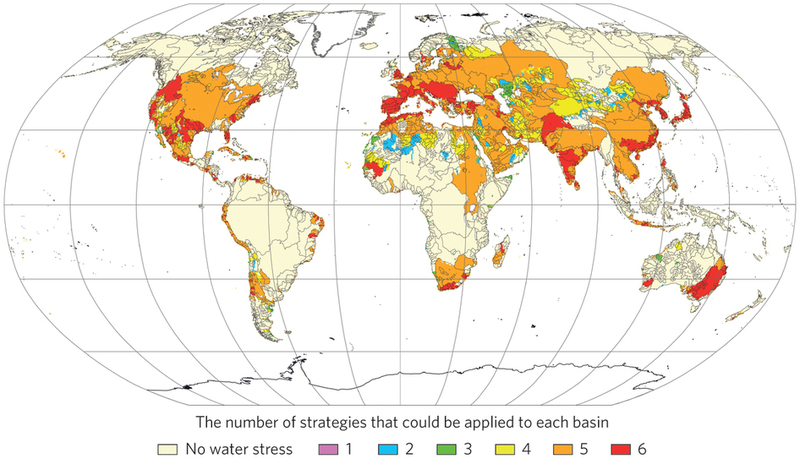 Based on current trends, roughly 40 percent of the world’s population will live in a stressed basin by 2050. Gleeson and his colleagues wondered what it would take to reduce that proportion in 2050 by 12 percent, to a level lower than today. They tested six wedges, or strategies to save or produce more water. Each strategy would decrease the number of people in water stressed basins by 2 percent. Two of the wedges involve building new hardware: desalination plants or reservoirs, options often called the “hard path.” The other four wedges are “soft path” options, or strategies that seek to reduce demand rather than increase supply. The research team decided which options would be appropriate for which stressed basins (irrigation improvements in basins with irrigation; desalination in coastal basins) and then randomly selected basins that would get that project. Computer models added water to each basin, either through reductions in demand or increases in supply, until withdraws dropped below the 40 percent threshold that defines water stress. The method was then applied to other basins until 2 percent of the world’s population was pulled out of water stress for that wedge. The process was repeated for each of the wedges. The result is a scorecard showing how each strategy reduces an equivalent amount of water stress. For desalination, a 50-fold increase in production is necessary to reduce water stress by 2 percent. Similarly, irrigation efficiency would have to improve by 1 percent per year, or 40 percent in total. Improvements to domestic pipes would have to save 0.5 percent per year, or 20 percent. These comparisons are the core of the wedge idea, according to Gleeson. Of course, several factors were not evaluated in this analysis, which Gleeson described as a “first approach” that can be adapted to analyze individual basins as well as global trends. Many of the options have significant negative consequences that were not taken into account. Increasing fertilizer use, for example, increases productivity but it can also pollute rivers and create dead zones in thriving downstream fisheries. The researchers also did not evaluate the cost of the options, which, in the case of dams and desalination, can run into the billions of dollars. State-of-the-art irrigation systems can also be prohibitively expensive for farmers, especially when water is so cheap. And a whole set of options – reduction in meat consumption or increased trade in water-intensive goods – was not analyzed. The approach itself is dispassionately utilitarian, where five people are more valued than one person. The comparisons are an important tool, but it remains to be seen whether an approach that values the generic can overcome the lively politics of interest groups and the voices of full-blooded individuals clamoring for aid.